Marcella Brooks’ shot from the left of the goal box to the far right side of the net, just past the reach of Shadow Ridge goalie Cassandra Tolton with three minutes left in overtime, lifted Centennial to a 3-2 win Wednesday in the Class 4A Mountain Region girls soccer quarterfinals at Bettye Wilson Soccer Complex. Centennial senior Marcella Brooks went into the postseason with 98 career goals for the Bulldogs. Her 99th might have been the most exhilarating and most special of them all. Brooks’ shot from the left of the goal box to the far right side of the net, just past the reach of Shadow Ridge goalie Cassandra Tolton with three minutes left in overtime, lifted Centennial to a 3-2 win Wednesday in the Class 4A Mountain Region girls soccer quarterfinals at Bettye Wilson Soccer Complex. The Bulldogs (14-3-4) were on the doorstep several times in overtime, as Brooks’ pass to Viviana Cera went untouched in front of an empty net and Brooks’ first shot in the extra frame clanked off the side post moments before the game-winner. With the teams tied at halftime, 1-1, it took 16 minutes for the Mustangs (11-8-2) to get the ball into Centennial’s zone, as the Bulldogs controlled the tempo and continued to pepper Tolton, who was outstanding in finishing with 13 saves, including a pair of incredible stops against Kendra Garcia and Quincy Bonds in the 52nd minute that kept the game knotted. “Last game of her senior year, she went out with one of the best games I’ve seen her play,” Shadow Ridge coach Kalah Williams said of Tolton. Shadow Ridge took a 2-1 lead in the 63rd minute, when Taylor Lee punched it in after a corner kick ended up getting bounced around in traffic and Taylore Simmons fed the ball near the right corner of the box. With three minutes left in regulation, Bonds raced by two defenders down the right side of the field, cut toward the box and as she was falling to the turf, and beat Tolton to tie the game. Bonds was speaking of the late Brooke Hawley, who would have been a senior at Centennial this season. Hawley was killed by a drunk driver in March, and the Bulldogs have dedicated their season to her. 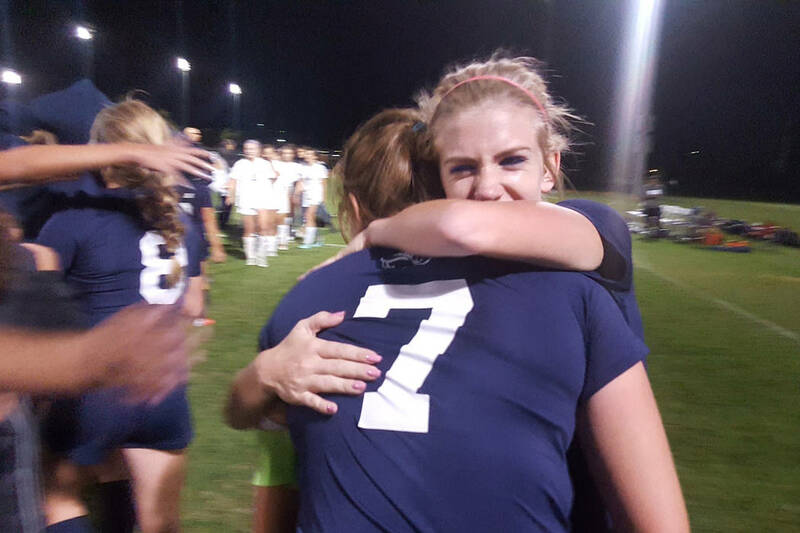 Aubree Neal also scored for Shadow Ridge. Cera scored Centennial’s first goal, and keeper Keyla Alba made 12 saves. Centennial plays Faith Lutheran (18-2) in one semifinal on Thursday, while Arbor View (13-3-5) meets Palo Verde (12-4-3) in the other. Both games are at 6 p.m. at Bettye Wilson. Faith Lutheran 6, Canyon Springs 0 — Madison Sonerholm scored two goals, and Kennedy Lazenby, Hannah Thomas, Serene Gronauer and Camille Longabardi each added a goal for the Crusaders in their win over the Pioneers. Goalkeeper Jordan Brown earned her ninth shutout of the season after making four saves to silence the Pioneers (3-11-3). Palo Verde 9, Rancho 0 — Alabama-bound senior Carlee Giammona recorded a hat trick for the Panthers to help run by the Rams. Kassidy Sayles scored a pair for the Panthers, and Katelyn Fann, Taylor Crouch, Alexis Blue and Campbell commit Taryn Phillips each scored once. Sarah Saxe had one save against the Rams (5-10-1) to record the shutout. Arbor View 4, Las Vegas 0 — Amber Mallas scored twice, and Preshus McCraney and Brynn Covington each scored a goal to lead the Aggies over the Wildcats. Krystin Cooper made five saves to shut out the Wildcats (9-6-1).